The Mark II Infantry Tank, better known by its nickname Matilda, is one of the best-known weapons platforms of World War II. As the mount of 7 Royal Tank Regiment (7 RTR) in the first counteroffensive against the Italians in North Africa it was a decisive weapon, and even the better-trained and better-equipped Germans knew to respect the Matilda; only the 88mm anti-aircraft/anti-tank gun could be counted upon to penetrate its frontal armor. Certainly, the Matilda had its time in the sun. Yet it was based on a flawed concept that did not shorten its service life, but definitely hastened its obsolescence. The British Army divided its tanks into two varieties, infantry and cruiser types. Cruiser tanks were intended to fulfill roles traditionally played by the horse cavalry, such as exploitation and pursuit, whereas the place of the infantry tanks was alongside the foot soldiers, providing them support. The first required mobility, at the expense of protection, and the latter reversed the equation. 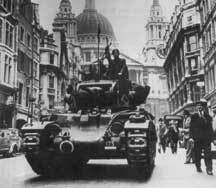 Matilda tanks on parade in London, at the outset of the war. The Mark I Infantry Tank "Matilda" was designed in 1934, and expense was one of the primary requirements. The specification called for a vehicle costing no more than £6,000, or about $25,000 in contemporary American currency. Hence the designers opted for off-the-shelf components, starting with a barely-suitable Ford V8 engine and a suspension taken from a tank design with half the weight. Armament also suffered, consisting of a single .303 machine gun, later upgraded to a .50 Vickers model in an armored sleeve. The top speed was a stately eight miles per hour. The Spanish Civil War taught that a slow-moving, lightly-armored and under-armed tank was going to be ineffective. As a result, most major powers pushed the development of vehicles that were both heavier and faster. Britain's response was the Mark II Infantry Tank, also know as the Matilda II. It was an undeniable improvement over the original, with armor thickened to three inches, armored skirts to protect the tracks, and replacement of the old Ford engine with a pair of AEC diesels, raising its top speed to about fifteen miles per hour. The machine-gun main armament was replaced with a cannon, the two-pounder anti-tank gun standard to the British as both a tank-mounted and towed weapon. As much of an improvement as the Mark II proved, it suffered from one shortcoming inherited from the Matilda I. The hull was too narrow to allow the installation of a larger turret, so the later model kept the less-efficient two-man turret instead of a three-man component, which further limited its ability to carry larger weapons. The new model was harder to manufacture too, as it called for large castings for the turret and glacis. Trials were completed by 1938 and the start of Britain's rearmament. Still, procurement issues meant that when 7 RTR went to France with the British Expeditionary Force at the start of World War II, only twenty-three of its tanks were Matilda II's, with the rest being the Matilida I. The Matilda's baptism by fire came on 21 May 1940, with a combined Anglo-French counterattack south of Arras against Erwin Rommel's 7th Panzer Division. The effort was a desperate attempt to cope with the panzers after their breakthroughs at Sedan and Dinant, and did little more than perhaps delay the German drive across France. However, the Matilda established its most important characteristic at Arras: protection. It was proof against almost all German anti-tank weapons, short of the "88" and, despite the attack's ultimate repulse, the Matildas of 7 RTR and 4 RTR were instrumental in creating a local crisis for the Wehrmacht. In the end all of the British tanks were destroyed or abandoned in the Dunkirk evacuation. The Matilda would return, though, in an entirely different theater of war. Three events combined to spark the Matilda's reputation in the desert. One was the re-equipment of 7 RTR with the new Matilda Mark V, essentially a Mark II with an improved transmission, and with the engines upgraded to Leyland diesels. Secondly, 7 RTR was dispatched to the Western Desert Force in Egypt. Third, Benito Mussolini decided to exploit the Fall of France by declaring war on Britain on 10 June, expecting to feed on the carcass of a British Empire soon to be killed off by Nazi Germany. Accordingly the Italians invaded Egypt, pushing as far as Sidi Barrani. There, a combination of threat inflation and defeatism at the top of the army compelled it to stop and dig in. British Major General Sir Richard Nugent O'Connor launched one of the most sweeping offensives of World War II on 9 December 1940. Originally supposed to be a raid, it proved to be something far more devastating, and the Matilda was a major part of it. O'Connor did not incorporate 7 RTR into the 7th Armoured Division, rather holding them back as corps troops under the Western Desert Force. He recognized that a tank impervious to any defensive weapon fielded by the enemy gave him a special capability. Operation Compass began on the morning of 9 December 1940, and 7 RTR's Matildas led the attack on the Italian Nebeiwa fortified camp. The British infantry tanks surprised twenty-three Italian M11 tanks guarding a gap in the lines, destroying them before the crews could mount up. Soon, the Matildas were in the camp, while the 7th Rajput Regiment assaulted from the other side. The Italians of Gruppo Maletti fought with savage fury, but had no defense against the Matildas, and within three hours 4,000 defenders were forced to surrender. About three hours later, 7 RTR and the 5th Indian Brigade attacked a second camp, Tummar West. Along the way seven Matildas were knocked out by one weapon that might work against them -- landmines, and the attack was further impeded by a sandstorm. This time the British tankers and Indian infantry encountered no resistance, The post quickly surrendered, a decision hastened by refugees from Nebeiwa spread tales of terror about the unstoppable Matildas. Another 2,000 prisoners marched into captivity. A third, successful attack on Sidi Barrani the next day cemented the Matilda's place as the desert war's decisive shock weapon. Yet the Matilda quickly showed one of its major drawbacks. As the Western Desert Force pursued the Italians and swept over Cyrenaica, the slow-moving Matildas proved unable to keep up. The Matilda was a fine breakthrough tank, but in a fast-moving battle of maneuver, it was out of place. They were instrumental in punching into the fortresses of Bardia and Tobruk, then fell to the rear of the pursuit. A Matida passes a German tank in the North African desert. The Matilda went back into action in the desert in April, when an old foe appeared in Africa: Erwin Rommel. Sent to bail out the Italians and defend what was left of their territory in Libya, the general characteristically bent his orders to go on the offensive. The Matilda and 7 RTR continued to fight in Africa, and would again strike fear in the Germans, as they had at Arras. However, the Wehrmacht in Africa was an entirely different army than the Italians, despite the latter's periodic episodes of dramatic bravery. The first really one-sided defeat for the British when spearheaded by Matildas came with Operation Battleaxe in June 1941. German skill, and use of their 88's, shot the British offensive to pieces, wrecking over one hundred tanks of all types, including Matildas. Aggravating the British situation was a lack of a battlefield recovery system, so that destroyed tanks stayed that way, instead of being recovered for repair. Matildas continued to fight in all of the important desert battles, plus the defense of Crete, making its last major appearance in a British battle at Alamein, but it never recovered the status enjoyed during O'Connor's Operation Compass offensive. The Matilda was a complicated machine, and lacked the mobility for a free-wheeling war of mobility against a first-rate opponent who refused to dig in passively and await attack, as the Italians had done. In addition, technology passed it by. Tank guns got bigger and bigger; when the Matilda went into action at Arras, the standard German tank gun was 37mm, and by the time of the Gazala battles in May and June 1942, the Germans were transitioning from an adequate 50mm gun to a far superior long 50mm model, soon to be supplanted by high-velocity 75mm guns. For that matter, the Tiger tank lay not too far in the future, mounting the dreaded 88. Yet the narrow turret ring and small turret of the Matilda meant that it retained the 2-pounder (40mm) main gun. Though this was a major upgrade from the machine-gun main armament of the Matilda I, through most of the tank's operational lifetime it was thoroughly obsolete. Making matters worse, the 2-pounder did not have a high-explosive round, essential for attacking infantry and anti-tank guns; despite an infantry support role, the Matilda was severely handicapped in engaging the enemy foot soldiers or in making the most of its presence in a combined arms approach. It was still difficult to knock out, but other tanks were able to do more, and do it better and faster. The slow demise of the Matilda was in large part the result of the British infantry tank concept. Being designed along those lines, from the beginning the Matilda lacked the mobility and agility required in battles in which the pace was not set by the speed of the marching man. A fifteen-mile-per-hour speed limit, under the best conditions, simply was not fast enough, and in Africa the Matilda demonstrated reliability problems that further contributed to its unsuitability for sustained, high-tempo operations. It would always be a shock weapon, and not much more, in the face of a first-class foe such as the Wehrmacht. Ironically though, the Matilda was the only British tank to see service from the first day of the war to the last. Even though the war in the Mediterranean and Western Europe passed it by, it remained useful against the Japanese, an army with weak armor and anti-tank capabilities, including in Australian units. Even after the war, some Australian reserve units continued to operate it. The British also used it as a platform of special-use vehicles, including mine-clearing and flamethrowers, long after its utility as a British battle tank had passed. Additionally, if the British were loath to employ the Matilda themselves against the Germans, they freely supplied it to the Soviet Union under the terms of Lend-Lease. The Soviets used it as early as the battle for Moscow, and though most were expended in 1942, a few survived into 1944. Soviet crews did not like the Matilda, finding it too slow and unreliable. The armored skirts, fitted to protect the tracks, tended to clog with mud and snow, not a good characteristic for a fighting vehicle on the Eastern Front. The final irony of the Matilda was that though its first model was born in a spirit of cost containment, cost and relative difficulty of manufacture hastened its departure from first-line British service. The Valentine infantry tank had identical main armament, similar mobility and slightly less armor protection, and since it did not require large cast parts, it was cheaper and could be built in greater numbers. It was deployed to North Africa as early as the Battleaxe offensive, and served alongside the Matilda, slowly replacing it. The final verdict on the Matilda is that it was a successful design, within the limits of a flawed, outdated concept. Medium tanks, combining a better balance of armor, armament, and mobility were the future, and the Spanish lessons on the problems with tanks of low mobility held true throughout World War II. Even the Matilda's outstanding armor protection amounted for very little against an enemy with the imagination to employ anti-aircraft guns in an anti-tank role, as the 88 could penetrate any armor that the Allies would pit against it. The 2-pounder gun was inadequate against most armor and useless against soft targets, severely undermining the infantry support role. Against that, one must bear in mind that though heavily flawed, the Matilda could be an extremely potent weapon, under the right circumstances. There is an undeniable value in having an armored fighting vehicle against which the enemy has no ready defense, even if its armament is imperfect. In the real world and that of Operation Compass especially, "tank fright" is a very real phenomenon, and the Matilda inflicted plenty of it.